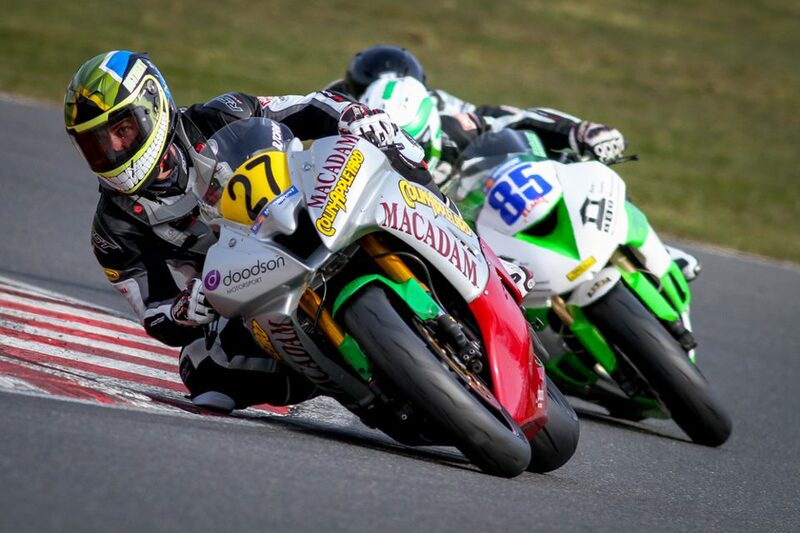 As PaddockChatter promised earlier in the year, we’ll regularly catch up with ever-cheerful South African Bjorn Estment as his debut season in the British Supersport championship unfolds and he chases the Superport Cup title with Appleyard/Macadam Yamaha. 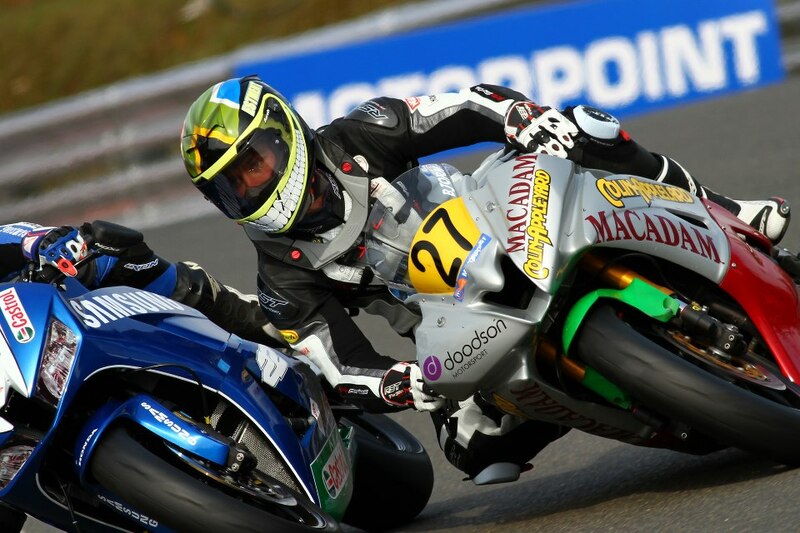 Here’s Bjorns recap on a successful Brands Hatch round one and looking ahead to round two this weekend at Thruxton…. “The time had finally come to kick off in the the biggest and most anticipated season of my short but busy motorcycle racing career. A massive thanks to the Appleyard/Macadam with Doodson Squad and loyal and long time personal Sponsor NFB Financial Services Group for helping me get this far, and now was the time to payback their loyalty. Arriving at Brands the excitement and nerve levels were sky high and I just could not wait for things to get going. The pits were set up, the motorhome was set up and a good night sleep required. Roll on Friday practice. However, waking up Friday morning I was greeted with bitterly cold and rainy conditions, not ideal nor what you would expect in a British ‘summer’ but we’re all faced with the same thing so the riders briefing took place as usual and then it was time to head out on the full wet set up and circulate around the track at a reasonable pace. Not much info or setup could be gained from the session and many a rider did not bother to venture onto the circuit. Practice two was a bit better with the track having dried up and ready for dry tyres but we were caught out a little bit with having a damp setup on the bike meaning a lack of feel from the front end of my machine made it difficult to push. We ended the session in P15 but just 1.1 sec off pole which is a bit further than I would have liked but steady progress, however it was still an awesome day and every lap onboard the Appleyards Supersport bike is awesome! Saturday was an interesting day and a whole new level of inner excitement and joy. Qualifying was interesting as it would be the first time I would experiment with different compounds of tyres and timing it to perfection in order to get the best possible grid spot. It began well and I was running P8 –P9 for the first half of the session and then came in to stick on the super soft rear to try stick in a great lap time. I had bettered my personal best but unfortunately got caught out by a bit of over exuberance and tucked the front end , fortunately into druids (slowest turn on the circuit) but was well protected by the RST Leathers and Leatt neck brace. On the positive side the bike and myself were completely unscathed and ready to go for the Sprint race in the afternoon which I would start from P12. Overall I find myself in 12thplace in the championship and 2nd in the cup a really solid start to the season. The next race is this weekend at the high speed and historic circuit, Thruxton. I must say a huge thanks to sponsors Colin Appleyard , Doug Macadam , NFB Financial Services Group, Doodson, Leatt Brace, Arai Helmets, RST Moto-Direct, Ive and Debs Racing and Pulse Engineering. So onwards to round two at the amazingly fast Thruxton circuit. As I write this the rain is coming down and looks like a wet start to the weekend with the forecast tomorrow too. After a really solid start to my debut Supersport campaign at Brands last week with those two points scoring finishes in the Championship and two podium placings in the cup, I am really looking forward to carrying the momentum into and around the fast and flowing Thruxton circuit.. I have a plan of attack for the season and if I can achieve all the ‘mini’ goals I set myself at each round I’m really confident that I can arrive at the end goal and enjoy a successful campaign in my first year in such a cut throat class of racing like British Supersport championship. I really like the layout and the nature of Thruxton as it presents me with many a similar style corner and bend to some of my race tracks back home so I hope this will serve as some sort of advantage to me as every bit counts in the BSS class. I have a good strong level of confidence and belief at the moment and intend to carry on building this up with every lap turned in. I look forward to another positive outing onbard the Appleyard/Macadam with Doodsen yamaha R6 and would like to thank the important Sponsors that stand by me as I mentioned earlier. So a good solid start for Bjorn for 2013 and we look forwards to hearing of his exploits at the fast but bumpy former airfield circuit in Hampshire. Previous Previous post: Waters: "Thruxton looks similar to tracks at home"